You are here: Virgin Islands News Online » News » Still no Labour Tribunal! "We have finally come to the point where one of our local Attorneys have agreed to do it for six months to help to clear the back log that we have in place and someone from the office in Trinidad is coming to the BVI in June I think it is to work with that person to give the necessary background and orientation in dealing with labour and labour disputes that we have in default," Dr Pickering had said in May. 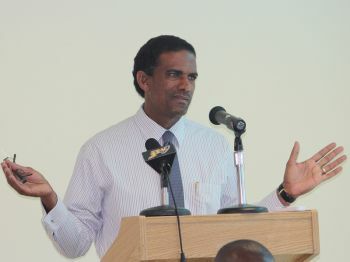 Contacted yesterday August 22, 2013, Permanent Secretary within the Ministry of Natural Resources and Labour, Mr Ronald F. Smith-Berkeley told Virgin Islands News Online that they are still in dialogue with and working closely with the International Labour Organsiation (ILO) office of Trinidad and Tobago to have the local labour tribunal in place at the earliest possible time. “Soon, very soon we will be having this in place. 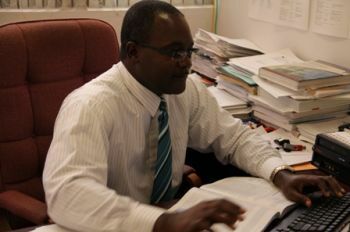 We are eager to get this up and running and they are just as eager to assist us with this,” stated Mr Smith-Berkeley. He also said he didn’t think government could have turned to a better source for assistance to get the labour tribunal in the Virgin Islands established. The Ministry has been bombarded with calls by many expressing concerns about the issue, Smith-Berkeley also said. “I must say that we are making some strides with this and we must apologize to everyone for the delay but we must get this started and it must work for everyone concerned,” added Smith-Berkeley. However, he noted that he was not in a position to give a definite date as to when the process would actually get started. According to the Permanent Secretary, the issue was one of several that was top of his agenda when he recently represented the Honourable Minister at a Ministers’ Conference and did make strides with discussions that have put the process a bit closer to becoming a reality. As first announced by Hon. Pickering, Mr Smith-Berkeley said the local attorney who had committed to taking up the position as chairman of the Labour Tribunal for a stipulated period is still holding to his/her commitment. He added that at this stage he was still not at liberty to make the attorney’s name public. “We will do so when the time is right,” said Mr Smith-Berkeley. When making the announcement back in May, Hon Pickering had said it was a very daunting task to find someone to fill the position of the Chairman of Labour Dispute Tribunal as the law specifically states that it has to be a senior Attorney-At-Law who is at least of ten years experience. The position as Chairman of the Labour Tribunal requires voluntary service while some payments would be given in the form of a stipend, the Hon. Minister had stated. Back in December 2012, Complaints Commissioner Elton Georges had stated in a report to the House of Assembly that successive Governments have failed to appoint the key body of the Labour Code, 2010: the Arbitral Tribunal; a situation Hon. Pickering had described as causing “serious difficulty” after failing to appoint a head of the tribunal even with a shortage of applicants lining up for the post. Ndp is all about talk no action! This is more like the NDP actively stalling to implement. If there were a tribunal in place to resolve labour disputes, it would certainly hurt a large swath of the big corporations who most likely fund the NDP. We need new laws that require politicians and political parties to disclose who is contributing money to their coffers. pickering is the worst thing ever happen to labor department. Stop the Dr. Pickering bashing. Its really old and tired now and he is but one man. What makes you think they are not ALL cut from the same cloth? We vote politicians VIP and NDP in that claim they will help us, but in the end help themselves via corruption! Which brings up another point. When is the government going to start enforcing the regulations and labour laws that are already in place?